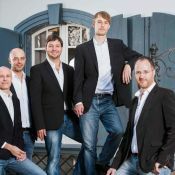 Das Ensemble La Pedrina nimmt ihre erste CD auf! Auf dem Programm stehen Madrigale von Luca Marenzio auf Texte von Battista Guarinis «Il pastor fido» in einer bisher nie eingespielten Fassung. Jetzt mit einem Video aus dem Konzert vom 25.6 in Zürich! Maintenand avec un vidéo du concert du 25.6 à Zurich! Now with a video-clip from the concert in Zurich on 25.6! Ora con un video del concerto di Zurigo del 25.6! Pour nos amis francophones : maintenant tous les infos sont aussi disponibles en français! Per tutti i nostri amici che parlano italiano: ora potete leggere le informazioni nella vostra lingua! For our friends from outside Switzerland: Now you can read all information also in English! This project ended successfully on 2/7/2017 21:00! Be the first to get a freshly pressed CD! Would you like to listen to the music live? You can come to the concert in the church of Zurich-Oberstrass on Sunday 25 June. We'll send you also the CD as soon as it is released! Stay updated! Not only you’ll receive a CD and a free concert ticket, you’ll be a patron of the Ensemble La Pedrina. You’ll receive personalised information about our activities as well as discount tickets for one year for each concert organised by the association itself! The ensemble «La Pedrina» was founded in 2016 by Francesco Saverio Pedrini. The musicians regularly perform with renowned ensembles such as Le concert spirituel, Concerto Italiano and others. «La Pedrina» featured in 2016 in the concert series «Freunde alter Musik Basel». In 2018 its first CD will be issued for the label Claves.